Well, very important. And as a family owned business we take our reputation very seriously. 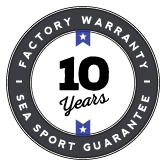 Our warranty is more than just words and a sales tool. If you have a problem, call our factory and talk with one of our owners. We will get to the bottom of the issue and correct it. No other boat in our class can touch our coverage, our level of support, and our commitment to you as a boat owner. Hull/deck joints, bulkheads, floor, transom, stringers, motor mounts/brackets. Wood/cabinets: All cabinets, tables, trim.